Get more shut-eye with these slumber-friendly downloads, says Liz Connor. There are plenty of legitimate reasons why so many of us don’t manage to clock up the optimal nightly eight hours of sleep that experts recommend – so if you’re yawning as you read this, you’re probably not alone. 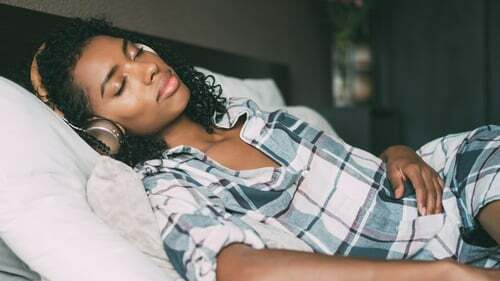 There’s no denying that getting plenty of rest is an essential part of a healthy and happy lifestyle: A great night’s sleep aids brain function, helps balance hormones and blood sugar levels, safeguards against mood swings and repair blood vessels. While your smartphone might be one of the things preventing you drifting off into blissful deep slumber every night, it could also be part of the solution – as there are now a number of apps designed to help you fall asleep faster and easier. This clever app creates personalised soundscapes to help you relax and drift off to sleep peacefully – think of it like the sleep DJ you never knew you needed. Simply plug in the amount of time you’d like to snooze for, and the app will adjust a timed mix to lull you into a deep slumber and gently rouse you when it’s time to wake up. If you struggle to focus at work in the daytime too, there’s also music designed to help you to work faster and more effectively, allowing you to get more done in your waking hours. Studies have shown that the blue light emitted from your device screens (smartphones included) can cause the body to suppress melatonin – a chemical which plays a key role in controlling our body clock and helps us to feel sleepy at night. That’s where Twilight comes in; it controls the light on your Android phone, depending on the time of day, making sure you’re not staring at a blue light just before it’s time to go to bed. This comprehensive meditation app has hundreds of different guided and unguided meditations to help you to switch off. Using helpful animations and soothing instructions from co-founder Andy Puddicombe, the app’s free 10-day trial talks you through 10 easy exercises that promote the calm and relaxation needed to fall asleep peacefully. If you find Headspace agrees with you, a subscription will unlock 550 more hours of voice-led meditations, with plenty that focus specifically on sleep. Don’t identify as a morning person? This intelligent alarm clock analyses your sleep patterns so it can wake you up during the lightest sleep phase, which is the natural waking point. Simply place your phone by your bed and Sleep Cycle will do the rest – monitoring your bedtime movements to track your sleep patterns. In the morning, you’ll get a full report of how well you slept, with handy graphs illustrating how alcohol and other lifestyle factors can affect your slumber. Napping is a tricky thing to get right: Sleep too much and you’ll risk feeling even worse than you did before you bedded down. VisualHype’s Power Nap App comes set with a nap timer that only goes up to half an hour long (experts say that any longer than 30 minutes will leave you feeling groggy and unbalanced), and includes built-in soothing audio tracks to help you nap more effectively. If you live in a busy urban area, sound pollution can be a major contributor to insomnia – and sometimes all you need to drift off peacefully is to cut out the background noise. Next time your neighbours are having a house party, try putting in your headphones and listening to white noise, a type of deeply relaxing sound that is produced by combining audio of all different frequencies together (babies love it!). This app has plenty of natural and man-made sounds to help zen out to, such as crackling camp fires, air conditioners, hair dryers, rain on a car roof and crickets chirping. Even better, the adverts are visual only, and the sound works while the phone is locked – so you won’t be disturbed as you drift away.